Maruti Suzuki has launched facelift edition of the Swift DZire compact sedan earlier this year and the new edition has been received well by the Indian buyers. The manufacturer has recently added models featuring the revolutionary Auto Manual Transmission gear box such as Celerio which has turned out into big hit. 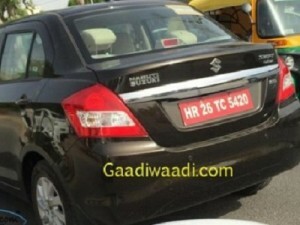 Now, Maruti is looking forward to launch an AMT variant of Swift DZire which has already been moved to testing phase. An enthusiast has recently spotted a test mule of the upcoming Auto Manual version of Swift DZire and has managed to capture few snaps of the same. As the Indian giant has upgraded the exterior look of the model earlier this year by launching facelift, the new variant haven’t featured any cosmetic changes at all. Thus the respective test mule was not at all wearing any camouflage. Tata Zest sedan is the only model in the Indian market which is being offered with an Auto Manual Transmission gear box currently and the upcoming Swift DZire AMT could be a threat for the same due to its best in class mileage. Swift DZire AMT will get powered with the same 1.3 litre Multi jet diesel engine that is capable of delivering around 74 bhp power output along with 190 Nm torque. The manufacturer is likely to import the Auto Manual Transmission gear box from the Italian AMT kit supplier – Magneti Marelli. It is also informed that the test mule spotted was the top end diesel variant of the compact sedan namely the ‘ZDi’. The sedan will offer some of premium features such as dual front air bags, Electronic stability program, brake assistance system, EBD, ABS and automatic climate control system etc. Maruti Suzuki is offering the best in class mileage of 26.59 kmpl with the Swift Dzire sedan currently and the addition of the Auto Manual Transmission gear box is expected to deliver the same without any difficulty. We can expect the official debut of the model by the end of this festive season in October. This entry was posted in Autos, News on May 29, 2015 by UdutaHK.